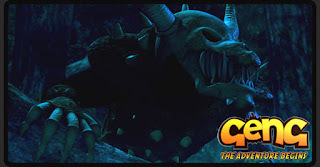 I just got back a while ago from the screening of Geng The Adventure Begins or Geng PengembaraanBermula. 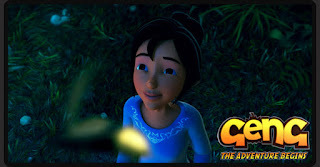 If you haven't heard of it and are thinking at the moment 'Oh it must be just another failed local (Malaysian) attempt of a movie' - and might I add an animated one too, 'I will just let it pass', you say. Well that my friend you should not do. Honestly I might have let it pass myself not being much of a local movie fan. Ok not a fan period. Till now. If I'm not a fan how did I end up at the screening you may ask. I'm proud to say the key people behind this national milestone are my Uni mates from Multimedia University of which some are friends =) That said, I'm not blowing their horn (that doesn't sound right..) cos they are my mates. I mean if I watched it and I truly believed it sucked I would not bother sitting up at 4am and writing this. Two KL boys Badrul and his friend Lim go back to Badrul's gramps' village where there is said to be a Durian (yes that smelly fruit that foreigners think we are crazy to love with all our heart but they would rather eat life roaches on Fear Factor..) thief whom the villagers belief to be a ghost. As soon as the boys enter the village they are greeted by a host of buoyant lovable characters. 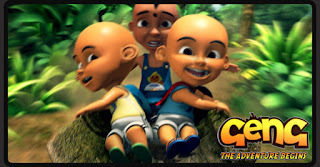 Very quickly they get acquainted to two cheeky little lads Ipin,Upin, thier sister Kak Ros(the only chick in the movie) whom is not a very tolerable or affectionate person and later Rajoo. Rajoo though timid compared to the crazy fun loving twins is more matured because of his age and is gifted with an ability like Ma-Ti from Captain Planet. 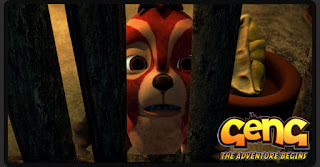 What started of as a trip to the orchard to pick some Durians becomes the adventure of their life when they meet a bizarre little creature and a few uncanny beasts that lead them deeper and deeper into the jungle. Les' Copaque Production really did their homework. 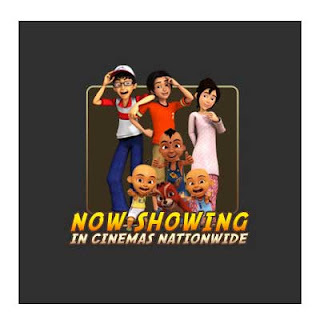 They adhere to the typical Malaysian Truly Asia way of making a movie where at least 3 main ethnic groups are portrayed. I usually get put off and annoyed by the stereotypes, but I must say this was very tastefully and cleverly done. What you usually get is one of the ethnic characters, usually the Indian followed by the Chinese one being the brunt of all the slapstick cheap jokes. It's safe to say that these people at Les' Copaque had extensively studied people or rather have an innate understanding of people per se. What I found intriguing though is that Rajoo was given quite a significant role which is very rare for a local movie especially one produced by a largely non-Indian team (no racial slur here, just stating as a matter of fact so don't call the freaking ISA on me!). I have a habit of talking, checking my messages occasionally and getting fidgety but this was not the case with this movie. You will be lucky if you get to blink an eye cos there is always something happening on screen. I also love that it has action, suspense, comedy and the parts that make you go awwwww. 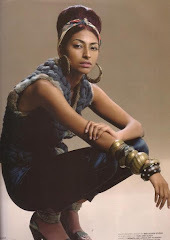 To me all of it was put together seamlessly and left me no room for complaints. Don't miss the chance to catch this in cinemas. I'm telling you DVD is just not gona do it...you won't believe how awesome the action scenes are until you watch it. Anas, Zaid, Shafiq - Im so proud of you and your team. Thumbs and Bigtoes up for yo! Ghost? Beast? Yo mama's Pet Rat? P/S. My mom and bro have decided to watch it and I'm gonna go again. Thaaaaaaaaaaaaaaaanks Abs. We really really appreciate you coming yesterday and enjoying the film. Of course la Rajoo banyak role. Rajoo aku nye feveret okay! And dangit apesal aku Opet? 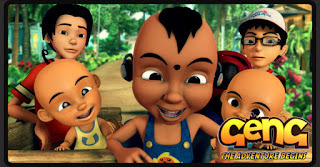 Gegege Teah, the voice for Upin and Ipin is my anak saudara! Yeay yeay. Hrm. I went again and it was still great. They extended the cinema screening period. That can only mean it was good =) Go watch!seriously just try with an open mind babe.